I know it’s been a while since we were in Matthew together. We took a break for Palm Sunday and Resurrection Sunday, so let me remind you where we are. So we’re learning to follow Him in the Gospel of Matthew. Where Jesus teaches with unequaled authority what it means to live as a citizen of the kingdom of heaven–a kingdom which He has announced has drawn near. It’s going to take us a while to get through Jesus’ Sermon on the Mount, but that’s not a bad thing. This teaching deserves all of the attention that we can give it. Jesus began His message by declaring what a flourishing life looks like. “The good life.” And it was different than what we might expect. In fact, just about everything Jesus says in these chapters is different than we might expect! Jesus turns our expectations upside down. Jesus turns our world upside down. Jesus describes a kingdom that, to us, seems upside down! Where the people who are blessed are those who are needy, sad, lowly, unsatisfied and even persecuted because of following Him. But that’s the way it really is. That’s where the flourishing is. And then Jesus told His disciples that they are salt and they are light. They are going to have a big influence on their world. Jesus’ followers are world-changers making a real and visible difference in the world to glory of their Father in heaven. Well, that was just the introduction to His amazing sermon. Now, Jesus gets down to brass tacks. Now, Jesus is going to get off to the races. And He’s going to say some more radical things. Jesus has already turned their world upside down. Now He’s going to do it again. He’s going to say some more audaciously surprising things, and He’s going to say them authoritatively. With audacious authority. I almost titled this sermon that, but I’m going to save it because that’s a like theme that’s going to come up again and again in Matthew. But as I read it to you, think about what He’s saying about Himself here. I think we’re just used to it. But imagine anybody else talking this way and what you and I would think if we heard them talking this way. Because what Jesus is going to say in this next section is going to rock the world of His listeners. And they are going to think from what He says that maybe He’s throwing out the first 2/3 of the Bible. What am I talking about there? The Old Testament, right? Did you ever notice that the Old Testament is quite a bit longer than the New? It’s roughly twice as long. Not exactly, but close enough for approximation. How did Jesus relate to the Old Testament? Well, let’s read it and see. I’ve had to begin using a new Bible because my old one is falling apart. Some of you may have noticed that my old one lost a few pages about a month ago. They were just the maps in the back, but the binding is coming apart, so I’ve switched over to this one. I’m told it’s a good sign when your Bible is falling apart from use because that means your life won’t be falling apart. I like the sound of that! But imagine for a second that I took my Bible, and I just ripped out the whole Old Testament and threw it away. We don’t need that any more! Pages flying everywhere. Cindy picks them up and puts the on my desk. And I say, “I said we don’t need those any more.” And I put them in the paper recycling. And I never refer to them again. And I tear them out of every Bible that I can find. And I delete the Old Testament on my computer. And I never from the Old Testament from this pulpit again. That’s kind of like what Jesus’ opponents thought He wanted to do. The way Jesus will interact with the Old Testament, especially the Mosaic Law, will lead some people, especially the Pharisees, to believe that Jesus was tossing it out of the Bible. And Jesus knows that they are going to think that way, so He heads them off at the pass and kicks off the main part of His Sermon on the Mount by dispelling that very idea. Look at again at the first part of verse 17. “That’s not why I’m here at all. I have not come on the scene to attack the Old Testament. Quite the opposite. Verse 17. #1. JESUS HAS COME TO FULFILL THE ENTIRE OLD TESTAMENT. “The Law and the Prophets” is one way of saying the whole thing, the whole Old Testament. And far from coming to abolish it, Jesus has come to fulfill it. Now, should not be a surprise to those who have been reading the Gospel of Matthew. We’ve already seen that “fulfill” is one of Matthew’s favorite words. Apparently, he gets it from Jesus! Matthew loves to point out that Jesus fills to the full the Old Testament. It’s part of His mission in life! He has come for this very purpose. The reason for Christmas is fulfilling the Law and the Prophets. The whole Old Testament is about Jesus. He doesn’t just say surprising things. He claims the first two thirds of the Bible are about Him! Do you believe that the whole Old Testament is about Jesus? 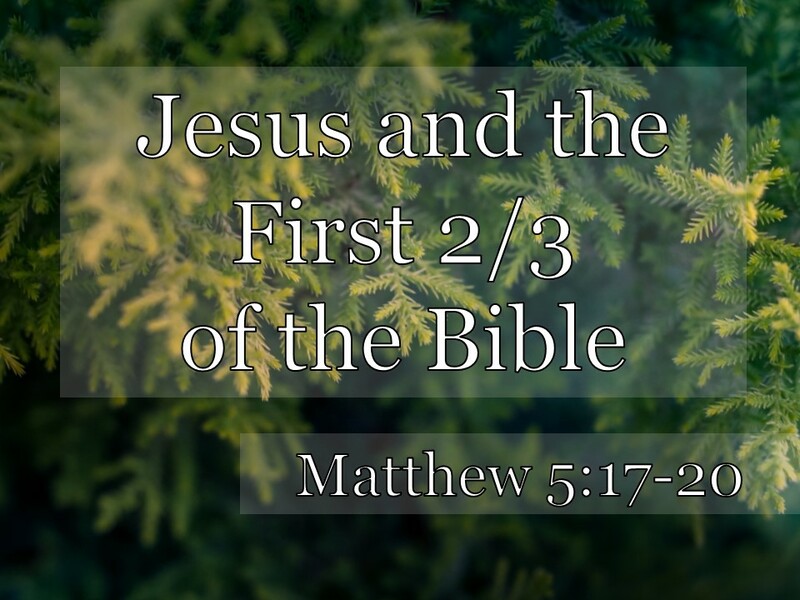 One of the goals of my preaching ministry for the last fifteen years or so has been to take us through the Big Story of the Old Testament and show how it relates to Jesus. What was our series called on the Books of Kings? When the kings were at their best, they reminded us of the promise of Jesus. When the kings were at their worst, they reminded us why we needed Jesus. Even the book of Leviticus. Even the Law of Moses in Exodus and Deuteronomy. Those things also pointed to Jesus. So don’t let anybody draw a big fat line between the Old Testament and the New Testament. And tell you that the Old Testament God was one thing and the New Testament God is another. Or that Jesus has come to save us from the Old Testament God. Or that Jesus threw out the Old Testament. There was a guy in the first couple centuries of the church named Marcion who did that. He cut out Old Testament from the Bible and tried to create a Christianity that was based on only the last third. “Do not think that I have come to abolish the Law or the Prophets; I have not come to abolish them but to fulfill them.” Verse 18. Jesus doubles down on this promise. He has come to fulfill the Old Testament, and He will fulfill the Old Testament. And nothing is going to stop Him. Do you know what jot is? The Greek is “iota,” like our letter “i,” and it stood for the Hebrew letter, “yod.” That’s where get "jot." Someone has gone through and counted them in the Old Testament. There are about 66,420 yods. Now the “tittle” is like this. Is this letter the same as this letter? The "tittle" is the little mark that makes the difference in letters like that (but in Hebrew). Tiny little things. But important, too, right? Imagine mixing up some of those letters and what that would do to the message? Jesus has come to fulfill the entire Old Testament. Now, that should encourage us. There isn’t anything that is going to be left out or dropped. Every promise will be fulfilled. Jesus will be everything the Old Testament anticipated. Temple, Sacrifice, Festivals, Clean & Unclean, Wisdom, Exoduses, Conquests, Return from Exile, so many things! Jesus will fulfill the entire Old Testament. And nothing, nothing, will be lost. It also should cause us to repent of our picking and choosing. Right? Maybe we don’t rip out the pages from our Bible. But we are tempted to pick and choose what we’re going to like or not like, right? What we are going to follow and not follow? We are tempted to not read some of those books. What’s your least favorite book in the Old Testament? Which ones are you tempted to skip over and not give any weight to in your life? I’m not saying they are all equally important (or understandable), but they are all God’s Word, and they are all fulfilled in Jesus. And we’re tempted to rip some of them out of our lives. What commands are you tempted to ignore? Because Jesus has come, things are going to change. The Old Testament remains God’s Word and important for us to read, but we stand in a different relationship to it. Now that Jesus has come and is fulfilling what the Old Testament was always driving at, some of those things will not be in play like they used to be. The group in Prayer Meeting has been studying the Book of Hebrews. It says why we no longer do animal sacrifices with the blood of bulls and goats. Why? Because Jesus has fulfilled them with His Perfect Sacrifice! Things are changing. Jesus is going to change things now that He’s come. But He’s not abolishing the Old Testament. He’s fulfilling it. You see Who He thinks He is? He thinks He’s the point of the first 2/3 of the Bible! So Jesus thinks that He is the best interpreter of the Old Testament because apparently it’s all about Him. For the next few weeks (verses 21 through 48), He’s going to interact with popular interpretations of things in the Old Testament Law, and He’s going to give his listeners what He considers to be the right one. And of course they are, but they are still going to turn things upside down. 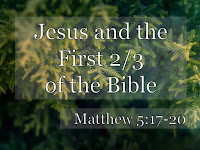 Now, “these commandments,” I think are the Old Testament commandments properly interpreted and applied by King Jesus, the Point of the Old Testament. If you break the Law of Christ and you teach others to do it, too, woe to you. But if you live out the Law of Christ and you teach others follow it, too, then you will be called great in the kingdom of heaven. What’s important is to make into the kingdom of heaven. 2. JESUS DEMANDS A GREATER RIGHTEOUSNESS. Greater, that is, than the Pharisees and the teachers of the law. Now, how is that supposed to make you feel? I’m sure that it made the people there gasp. When they heard Jesus say that, they probably passed out in shock. These were the most religious people on the planet. And Jesus was saying that you had to have a righteousness that surpassed theirs in kind and quality. Deeper and higher. And if you didn’t then you wouldn’t see the kingdom when it comes in all of its fullness. Raise your hand if you have a righteousness greater than the Pharisees and the teachers of the Law. Every genuine believer in this room has that righteousness! I mean think about what kind of righteousness the Pharisees had. It was mostly outward and showy. Is your righteousness outward and showy? It was mostly focused on the lesser of God’s commands and ignoring the greater of God’s commands. Is that your approach to holiness? The Pharisees righteousness was based on rule following not on trusting and loving God. Are you trying to please God through rule-following or by faith? The Pharisees and the teachers of the Law were prideful about their righteousness. They thought they were hot stuff. Do you think you are hot stuff? They kept looking for loopholes. Is that how you try to work out your righteousness? They were unchanged at the heart level. Has your heart been changed by Jesus? They had not experienced the new birth. Every genuine believer in this room has been born again. Your righteousness, if you truly belong to Jesus, is deeper and higher and greater in both kind and quality. And I’ll tell you one other thing. I don’t think it’s exactly what He’s talking about here, but we know from the rest of the New Testament that we also have Jesus’ righteousness on our account! So, it’s not that hard to have a righteousness that surpasses these guys. The newest believer in this room already does. Now, Jesus is going to unpack that for us in the next several weeks. In fact, I think that’s the point of the entire sermon on the mount. Demonstrating what this greater righteousness looks like from the perspective of the greatest interpreter of the Law. And it will challenge us. Jesus intends to turn our lives upside down so that we fit in His truly right-side-up kingdom. It will require repentance and change. And we won’t get to pick and choose which things we want to repent of or to change. Because He came to fulfill the entire Old Testament, the first 2/3 of our Bible. And He did it, ultimately, by taking our place on the Cross. And by His work on the Cross and in our hearts, we become the kind of followers that He wants us to be. [Matt's Messages] "But I Tell You"